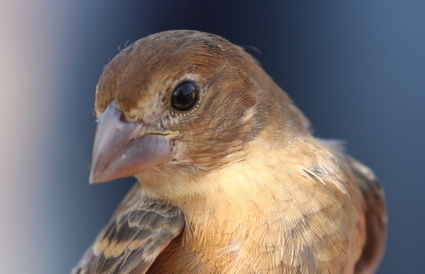 The Meadowlands Festival of Birding had a great turnout today, including this female Blue Grosbeak who showed up for the bird-banding demonstration in Harrier Meadow. Also making several appearances: Peregrine Falcons, Ospreys, Green herons, Black-crowned and Yellow-crowned and Great Blue Herons, umpteen egrets, Stilt Sandpipers, yellowlegs and so on. Oh, and an estimated 240 birders. Some 50 birders went on the Harrier Meadow morning bird walk, and more than three dozen attended the early morning bird-banding, which provided up-close looks at a Red-eyed Vireo, Ovenbird, Magnolia Warbler and Redstart. A total of 36 birds were banded and released.